The town of Snowmass continues to contemplate if pot shops belong in the village. If pot shops in Snowmass were placed quietly, off the beaten path with modest publicity, then the majority of the town’s marketing advisory board does not believe this would hurt the resort’s family-friendly image. While individual opinions varied, this was the common sentiment that members of Snowmass’ marketing, group sales and special events advisory board (less formally known as the tourism or marketing board) articulated at a regular meeting April 19. Town Council at its most recent meeting regarding marijuana, which is under a moratorium in Snowmass Village, said it wanted a recommendation from the tourism board. Specifically, the tourism board was to offer insight on whether it felt that allowing pot shops in Snowmass would taint the town’s reputation as a wholesome destination. In other words, Snowmass town spokesman Travis Elliot said, the marketing board recommended that the town not ban retail and medical dispensaries in the village. The reason for the language, he said, is to be clear that the board is not “strongly advocating” for pot shops. Board member Christian Knapp, chief marketing officer at Aspen Skiing Co., was the dissenting vote. Tourism board members John Quigley, Howard Gross and Reed Lewis were absent from the meeting but submitted comments detailing their views. Representing the lodging industry, Timberline Condominium general manager and board member Mary Harris said visitors ask “all the time” where they can buy pot. While Harris said she does not think this impacts visitors’ decision in booking a hotel in Aspen versus Snowmass, she said, “from a business standpoint, I think the town is losing a lot of revenue” by sending people to Aspen to buy weed. “I think a lot of people go into Aspen (for pot) and stay in Aspen to do their shopping or dining,” she said. Harris recommended allowing dispensaries within “a very limited couple of places” without flashy signs or advertisement. “To put it to the vote again is, to me, a waste of money and a waste of time,” Sura said. The survey Sura referred to is the marijuana questionnaire that the town conducted Dec. 21 to Jan. 21. 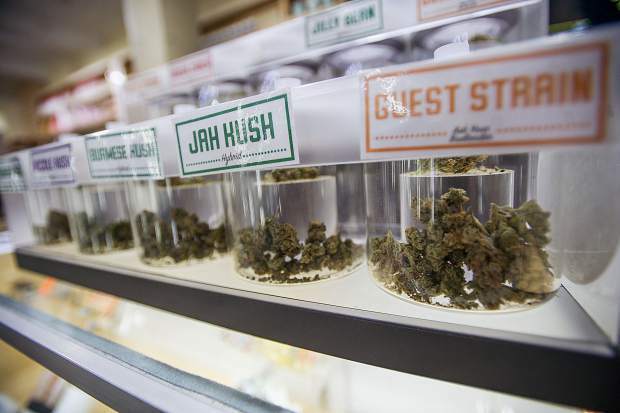 According to the results of that survey, to which 584 people responded, 55 percent of full-time Snowmass residents feel that marijuana establishments should be allowed, while 71 percent of part-time residents believe they should be prohibited. A number of part-time residents in Snowmass have been vocal on this issue, ensuring their voices are heard. Part-Time Resident Advisory Board Chairman Deb Cote said that while she is “pretty neutral” on the issue of pot in Snowmass, she wants the Town Council to take into consideration the part-timers’ opinions. Elliot said, “There is no calculation” when it comes to weighing the views of full- and part-time residents. “It’s a case-by-case basis, depending on the issue,” Elliot said, noting that it also may vary with each Town Council member. “We try to listen to all of our stakeholders, even if they’re not a resident at all,” he said, adding that, in addition to residents, the town solicits input from Snowmass employees and commuters, business owners and visitors. If the question were to go to a vote in November, the Snowmass Town Council would need to extend the moratorium a third time, as it will expire prior to the next election cycle. Snowmass Village first implemented its moratorium on medical and recreational marijuana establishments in September 2013, after Colorado voters approved recreational pot sales in November 2012. The council voted unanimously in February 2017 to extend the moratorium, which is in effect until Oct. 31. The Snowmass Town Council will review the tourism board’s feedback and continue marijuana discussion at a work session May 14.